On a recent Saturday morning, my wife, Wylene, and I had the opportunity to open a door that was new to us. 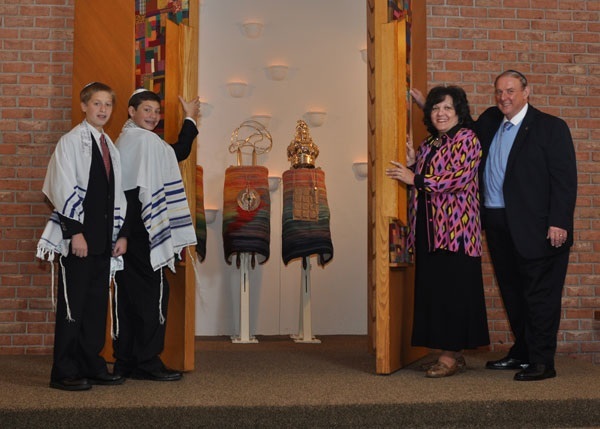 It was the door to the Ark at Temple Beth El in Spring Valley. It was a privilege and honor given to us by two special young men and wonderful friends, Harrison and Charles Dranoff. The twins gave us the honor of opening the Ark at their Bar Mitzvah, which is the “coming of age” ceremony for young Jewish boys in their thirteenth year; it is their “boys to men” ritual. And so, for Wylene and me, a new door was opened and we got to experience this new community of which we were a part, despite our differences. Photo courtesy of: Terence Lynch, Studio Eleven Productions in Nyack, NY. This made me think about Rockland Community College and about opening new doors and new windows for our 8,000 students of diverse backgrounds. As we approach Thanksgiving, I am reminded of a special group of students who come through our doors and who are pictured here at our Annual Thanksgiving Luncheon for International Students on November 16, 2011. Currently, there are 164 international students at RCC. They hail from 50 different countries! Seventy new international students enrolled in Fall 2011, an increase of 10% over Fall 2010. The top three countries represented by our international students are Japan, China and South Korea. This Fall, new international students are from Benin, Canada, Egypt, Georgia, Germany, Guatemala, Haiti, Italy, Nicaragua and Poland. 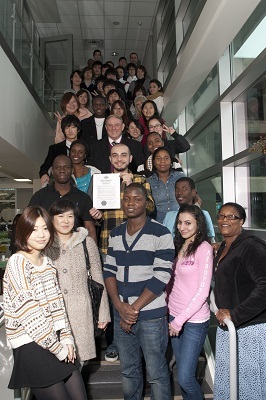 These international students study a variety of programs including Business Administration, Liberal Arts, Performing Arts, Nursing, Communication Media Arts and Computer Science. Additionally, we have many other students from around the world at RCC, including a large ESOL Program, which we offer in both our credit and non-credit divisions. Among this group are students who are here because of authorization from the State Education Department allowing certain non-resident students to be are eligible for resident tuition. These students graduated from high school in New York and are in the process of legalizing their immigration status. It is estimated that there are currently more than 10 million people in this country illegally, and our government needs to deal with this issue. I understand the need for massive immigration reform, and I also understand issues of security. Having said that, we must treat a group within this 10 million with special consideration. We must offer them a pathway to access and opportunity. This group includes undocumented students who were brought into the US illegally as children. Whatever the intention of their parents, they are “(men/women) without a country,” to use the words of Phillip Nolan. I have a concern for these students who want to attend college, but, because of their immigration status, are unable to do so despite the fact that they are “American” by virtue of their speech, language, culture and values. These students have attended school in the US, earned a high school diploma, been good citizens and, I think, should be granted citizenship. For many of them, this is the only home they have ever known. Resolving the problem for these students is the intent of the DREAM Act or Development, Relief and Education for Alien Minors Act. The act is designed to provide a pathway to citizenship for “minors of good character.” Over the last several years, I have met students who would be helped by this act. They have not been eligible for meaningful employment that would enable them to pursue a college degree. I have also had high school teachers visit my office, seeking assistance for students who have excelled in high school and have great potential. These students are victims of their parents’ actions. Although we are facing enormous issues in this country, we still need to be that beacon of hope, that land of opportunity for these students. Among US citizens, almost all of us or our families originally came from somewhere else. So I call out to elected officials to remember our heritage of access and opportunity. Remember our roots, and remember our responsibility to these young people. I go back to the Prayer Book and the morning a new door was opened for me, a time when I read, “You are the open door that beckons me in.” We need to be that portal of opportunity. 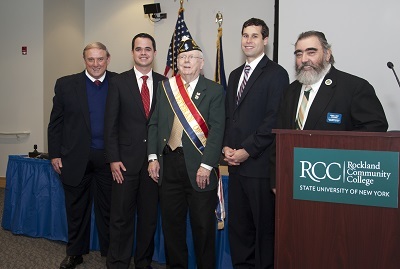 On November 7, RCC and the RCC Office of Veterans Affairs, honored and recognized our Veterans for Veterans Day. Jonathan Barnwell, Coordinator of Veterans Affairs, welcomed the group and the veterans from the following conflicts spoke on the panel discussion: War and Remembrance; WWII – Alan Moskin, USA; Korea – Bill Mahon, USA, (2011 Veteran of the Year); Vietnam – Jeremy Honey, USA; Grenada – Dennis Murphy, USA; Desert Storm & Bosnia – Geoff Hamilton, USA; Iraqi Campaign – John Roberts, USMC; Enduring Freedom – Evan Staley, USA. On November 11, Dr. Cliff L. Wood, RCC President, State Senator David Carlucci, 2011-12 Rockland County Veteran of the Year Award presented to Bill Mahan by Jeremy Honey, USA and Assemblyman Ken Zebrowski. 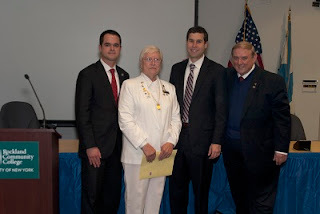 State Senator David Carlucci, Gold Star Mother Renate DeAngelis, Assemblyman Ken Zebrowski pose with Dr. Cliff L. Wood, RCC President, at the Veteran's Day Program.